I was introduced to Rob Turner's incredible pulptastic artwork back in 1990 something after a high school trip to England by a friend of mine. Looking at his work is like looking at a snap shot of an alternative pulp art tradition. The colors, the luridness, and everything about it screams excitement and jumps right out at the the viewer. These covers are packed with everything a fan of sci fi could want especially an old school gamer. I can't tell you the number of times the Black Avengers appeared in my games as enemies. Now most folks have never heard of one of the best comic book and sci fi artists whose work I admire and whose incredible pulp sensibility is still felt in my heart. 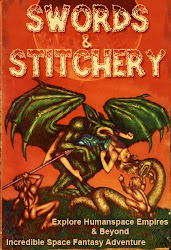 Ron Turner was an exceptional British artist of pulps,comic books,children's books,etc. The man's output was incredible. But who was he? Ron Turner (1922 – 19 December 1998) was a British illustrator and comic book artist. 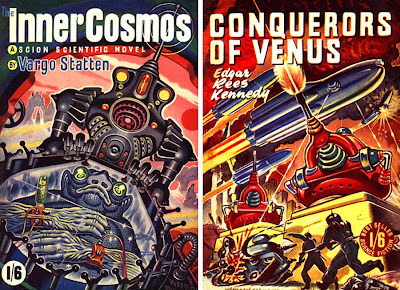 Ron Turner became interested in science fiction at an early age, with numerous works across several media: the novels of H.G. Wells, Edgar Rice Burroughs, andJules Verne; films and film serials such as Metropolis, Things to Come, and Flash Gordon; and Alex Raymond's comic strips. 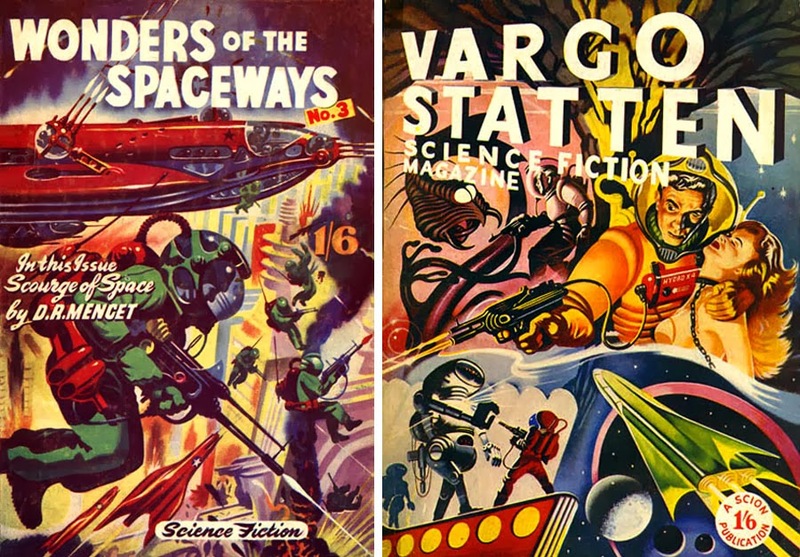 He developed a keen interest in American science-fiction pulp magazines, such as Amazing Stories and Astounding Stories (now known as Analog Science Fiction), and first started to develop his talent by attempting to copy the often spectacular cover illustrations. In 1936, at the age of 14, Turner first got work as an apprentice in Odhams, a London art studio and publishing house. By 1938, Turner was providing illustrations for the British magazine Modern Wonder. In 1940, Turner's professional art career was interrupted by the Second World War, and he was drafted into the British Army. He returned to professional illustration in the late 1940s, finding a job drawing comic strips for Scion's Big series, which were mostly centred around the crew of the Atomic Mole: a subterranean craft, that explored the theoretical "habitable spaces" beneath the Earth's crust. 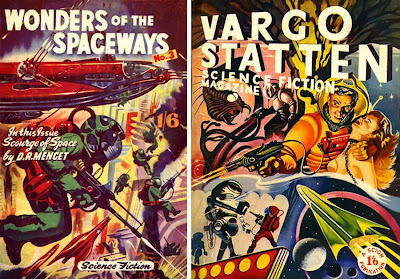 Odhams eventually began publishing a line of paperback fiction, for which Turner drew numerous covers, notably the Vargo Statten series by John Russell Fearn. Turner's art raised his profile to the extent that other publishers started to send him assignments. In 1953, Turner left Odhams to try his hand at freelancing and attempt to produce a regular comic strip in the style of British cartoonist Frank Hampson, whose work he admired. As the vogue for pulp science fiction dwindled, Turner found work doing cover illustrations again for numerous publications, such as the popular science journal Practical Mechanics. By the mid-1960s, Turner had mostly abandoned the world of monthly publishing, and was producing original paint-by-number paintings for the company Craftmaster. In 1965, Turner was offered the opportunity to draw his first colour comic strip, based on the Gerry Anderson TV series Stingray, for TV Century 21 Stingray Extra (a holiday special issue of the weekly comic TV Century 21). 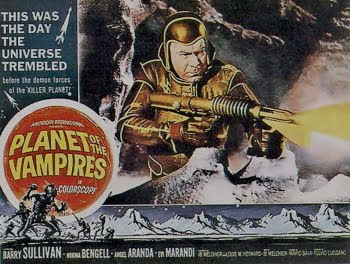 The following year, Turner began contributing to TV Century 21 on a regular basis with his first continuing colour comic strip, "The Daleks", featuring the mechanical villains from the TV series Doctor Who. Turner replaced the strip's previous artist Richard Jennings, initially for issues 50 and 51 (January 1966) and then on a regular basis from issue 59 (March 1966). He continued to illustrate The Daleks until its conclusion in issue 104 (January 1967). Between 1965 and 1969, Turner also contributed strips based on the various Anderson series to a number of TV Century 21 holiday specials and the publisher's hardback annual books, illustrating further Stingray strips in addition to ones based on Fireball XL5, Thunderbirds, Captain Scarlet and the Mysterons and Joe 90. He illustrated all 80 pages of the Joe 90 Puzzle Book and the same number for the Joe 90 Dot to Dot Book (both Century 21 Publishing, 1968) as well as providing strips based on the series The Champions, Star Trek and Land of the Giants for the Joe 90 Top Secret Annual (1969). In addition, he again found work with Amalgamated Press (now called Fleetway), taking over the black-and-white "Robot Builders" strip from Carlos Cruz[disambiguation needed] for Fleetway's Tiger and Hurricane comic magazine. In the 1970s, Turner began working for IPC Media (which had absorbed Fleetway), drawing strips for the Whizzer and Chips comic, such as "Wonder-car", "Archie's Angels" and "Danny Drew's Dialling Man", which were generally aimed at the young adult market. As well as contributing a regular Star Trek strip to IPC Media'sTV21, he also continued his association with Gerry Anderson with Thunderbirds strips for the 1972 Thunderbirds Annual and the 1973 Countdown Annual. In the late 1970s, Turner drew a number of "Judge Dredd" comic strips for 2000 A.D., although his style did not gain the favour of his editors, and the long-term assignment eventually fell to other artists. Instead, Turner found regular work on the re-launched version of IPC's formerly violent comic Action with "The Spinball Slaves"—a sequel to the science-fiction sport strip "Death Game 1999" (influenced by the 1975 film Rollerball) and its less violent sequel "Spinball". When Actionmerged with IPC's war comic Battle Picture Weekly to become Battle Action, Turner contributed a further "Spinball" sequel strip entitled "The Spinball Wars". He also worked on a revival of "Rick Random" in the re-titled 2000 A.D. and Star Lord. By this point, Turner had started regularly providing book cover illustrations once again, on this occasion for Gryphon Books. He also painted a new six-part "Daleks" strip for Doctor Who Magazine. Turner died of a stroke and a heart attack in 1998. His artwork has continued to appear posthumously on books published by Gryphon Books and Wildside Press, drawing on many previously unpublished pieces as well as re-printing his earlier book cover illustrations. The First Detective of the Space Age and Head of the Interplanetary Bureau of Investigation. (I.B.I.) (...Or Flash Gordon meets Philip Marlowe!) 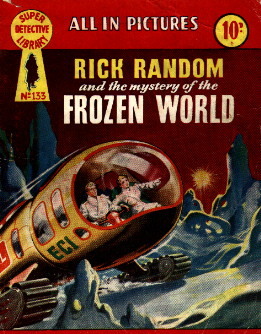 Rick Random solved his first space case in the pocket-sized Super Detective Library No. 37, Crime Rides the Spaceways. 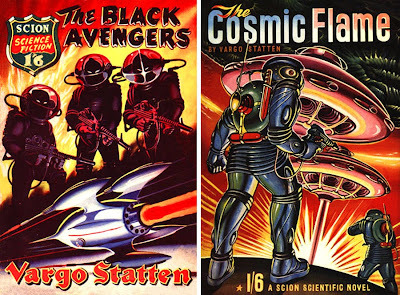 His artwork is perfect fodder for many of the sci fi pulptastic retroclones on the market. From Carcosa to X plorers and personally his artwork is a perfect fit for either Bandits and Battle Cruisers or Hulks & Horrors. The artwork pulls you into the action and doesn't let go. I love the clean lines of his artwork, the lurid subject matter and everything about his take on the subject matter. His work is exceptional and I knew that very few American sci fi fans know his work. Stumbling across his work today was like a pulp vision from another plane! So many ideas jump out at the viewer and the space adventures just seem to write themselves.